Product code: ES7808 Categories: Sold Items, Sold Jewellery. 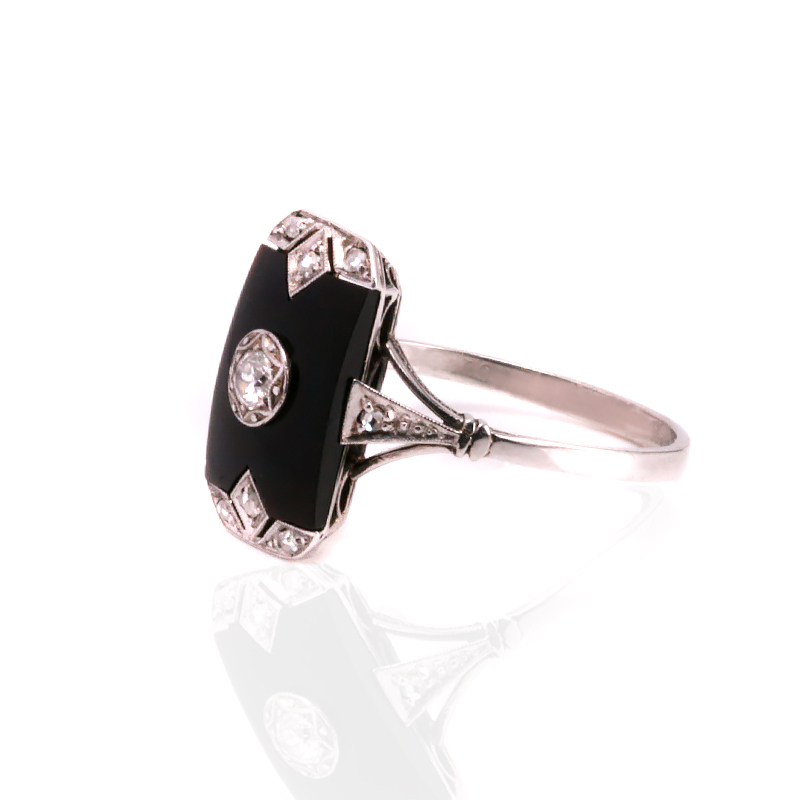 Art Deco jewellery of the 1920’s to the 1940’s is as popular today as when it was made, and when you see this Art Deco onyx and diamond ring dating from the 1920’s on your finger it is so easy to see why. Hand made in 18ct white gold and platinum, the use of the white metals contrasts so well with the pure black on the onyx. This simple black and white combination just works so well and when it is combined with diamonds, it gets even better. In the centre is an early brilliant cut diamond that not only sits proudly in the centre, but also has the most charming star design setting surrounding it. And then at each end are three rose cut diamonds, again in a very elegant setting with an additional rose cut diamond set onto each shoulder. These diamonds total 0.22 carats and really stand out against the black onyx. With the ring measuring 16mm by 9.8mm across, and being a genuine Art Deco ring, this ring is just spectacular and sure to always get the admiration that it deserves. Tag: Art Deco onyx and diamond ring. Jewellery of the Art Deco period often embraced the pure white colour of platinum which works so well with the pure black from the onyx. This Art Deco black onyx and diamond ring is set with rose cut diamonds and an early brilliant cut diamond in the centre. Art Deco rings are as popular today as when they were made all those years ago.